Grandma Sierra is a wonderful example of compassion and fortitude. 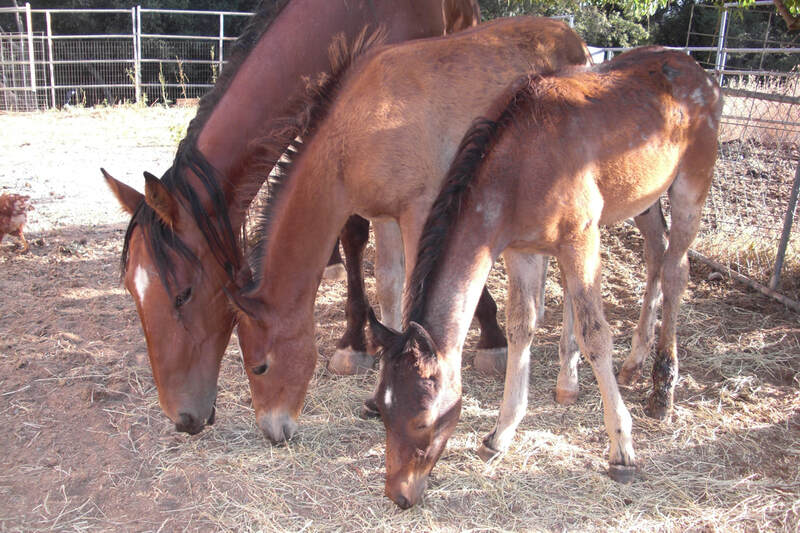 The SHORT story: when Sierra arrived from the feedlot in 2009, she had two young foals at her side, both nursing. 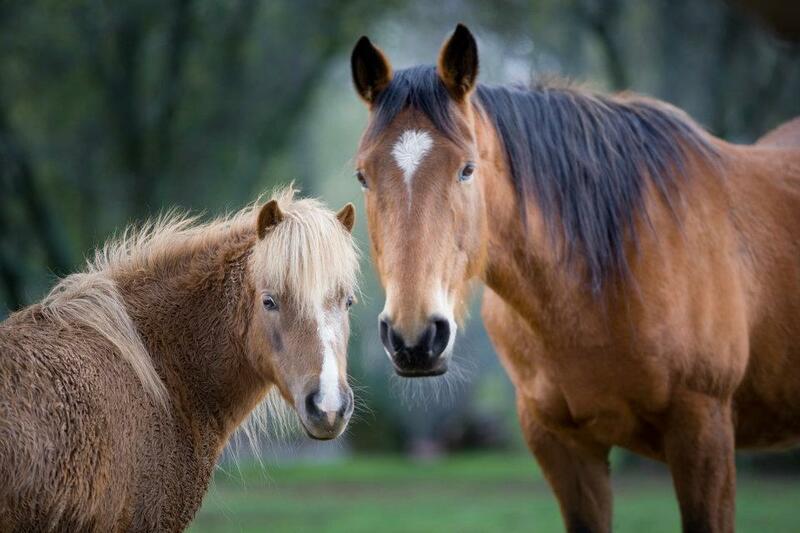 One was her own; the other she "adopted" when its mother was sent to slaughter. 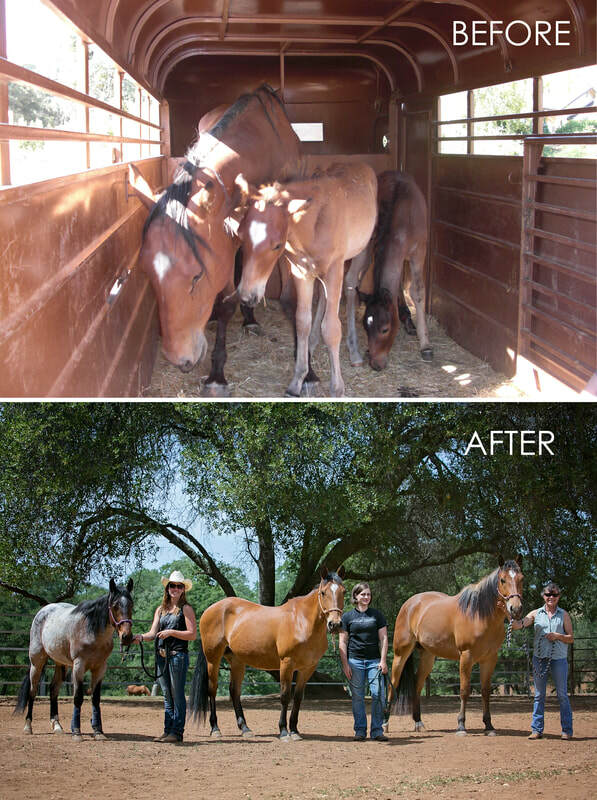 All were sickly and malnourished, but with special care by our volunteers, they all survived and eventually flourished. The two colts were adopted quickly into forever homes, but her colt, Dayton, returned after a few years due to a family health crisis. Sierra and her boy, Dayton, are now a permanent residents at the rescue. Sierra is the grand matriarch of the AAE herd. 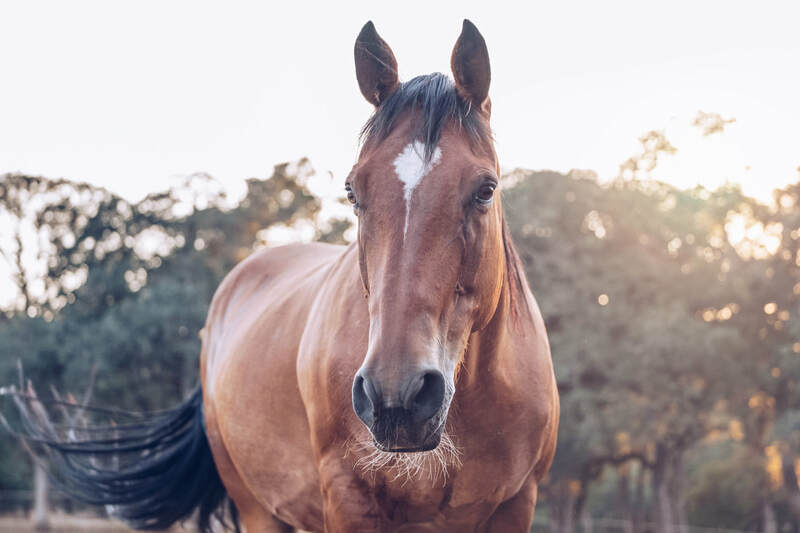 The younger horses naturally gravitate towards her for comfort and leadership, and she wisely teaches them their manners and proper horsey behavior. 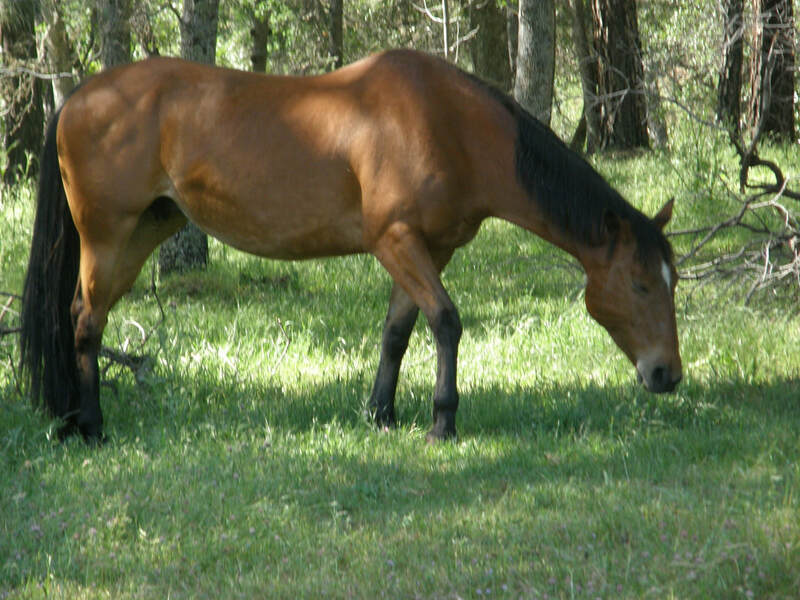 The LONG story: Sierra was rescued from a Canadian operated slaughterhouse-feedlot in July of 2009. She was depleted and days, maybe hours from death...if not by slaughter, by the extreme neglect of her owners. She was emaciated and starving, her head hung low from lack of strength, while her skin sagged upon her bones. 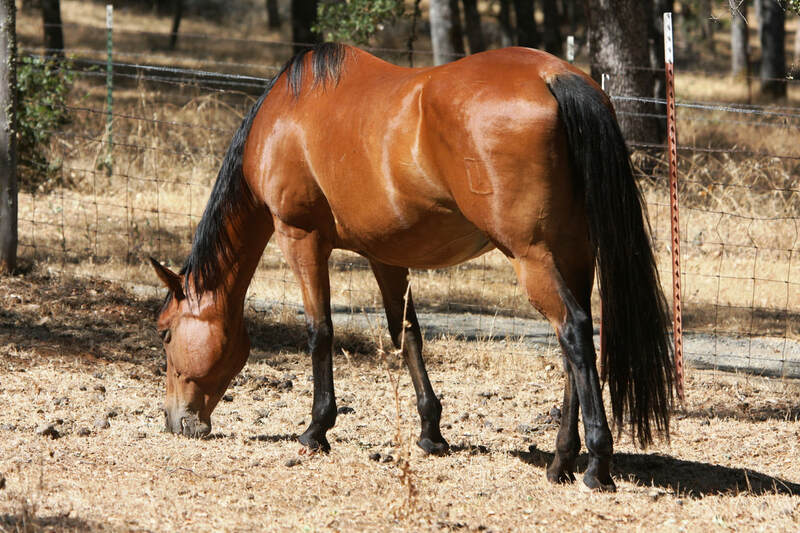 What we were told: We were told her owner's (ranchers) had been going through a bitter and relentless five year divorce, and their horses were left to fend for themselves. 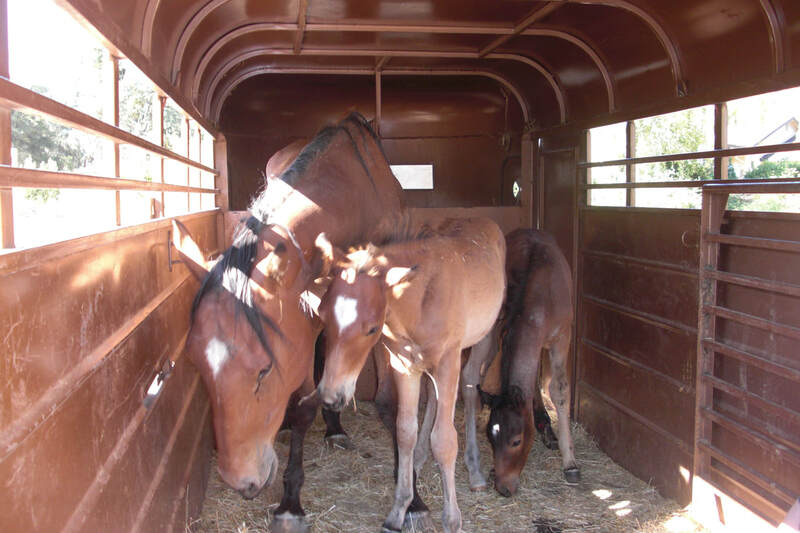 Because neither would agree who would care for the horses, and no one saw to it they were fed day in and day out, eventually they were loaded onto a big trailer rig, one-by-one, and headed to the feedlot where they would be sold for slaughter. Their owners were paid their meat value based on their weight. 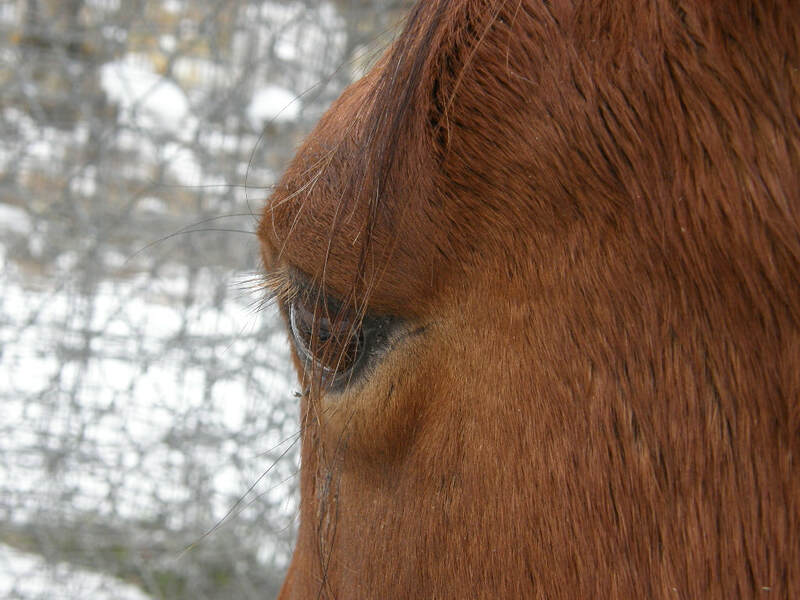 The horses faced a gruesome fate: terribly inhumane transportation and slaughter practices. Fortunately and unfortunately for Sierra, she wasn't alone. Her weeks old colt Dayton was by her side, but little did she know, they would be separated. We were told he would be shipped to slaughter in Canada, while he would be stripped from her side and sent to Mexico, where foal meat is a delicacy. 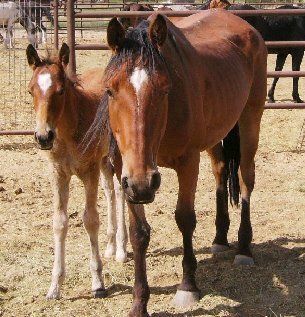 ​(This began AAE's efforts to rescue horses from feedlots, which we'd later learn was becoming a horribly opportunistic industry that preys on peoples emotions, to hold horses ransom under the threat of shipping to slaughter within a very short timeline. Read more here and here. 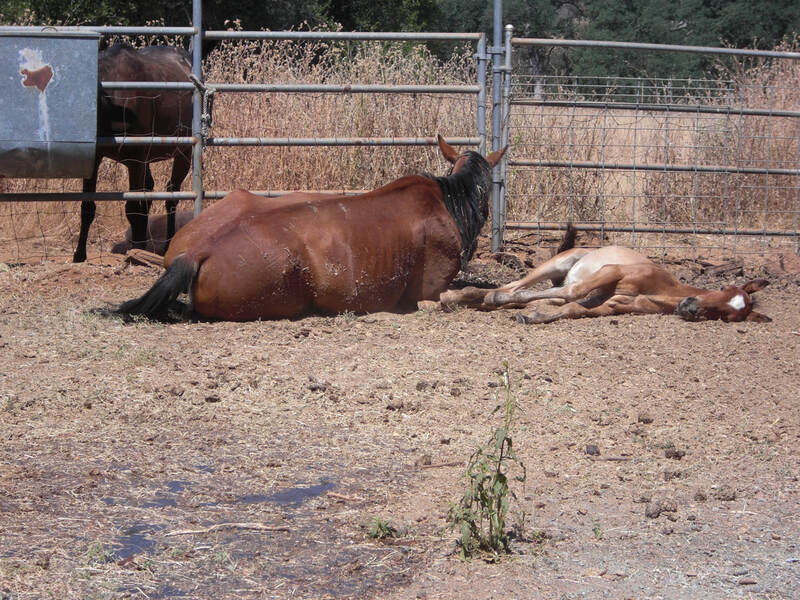 After learning more about these deceptive practices, AAE opted to focus it's efforts rescuing horses before they end up at a feedlot, as there are so many more horses in need. AAE focuses it's efforts on local and regional distress cases, auction rescues, and collaboration with other organizations in need). After hearing what we heard and seeing feedlot conditions when we picked up Sierra from the feedlot, we could only imagine. Sierra unloads off the trailer onto the feedlot. Dayton struggles among the bigger horses to stay by her side as the horses stampeded from the trailer onto the feedlot. 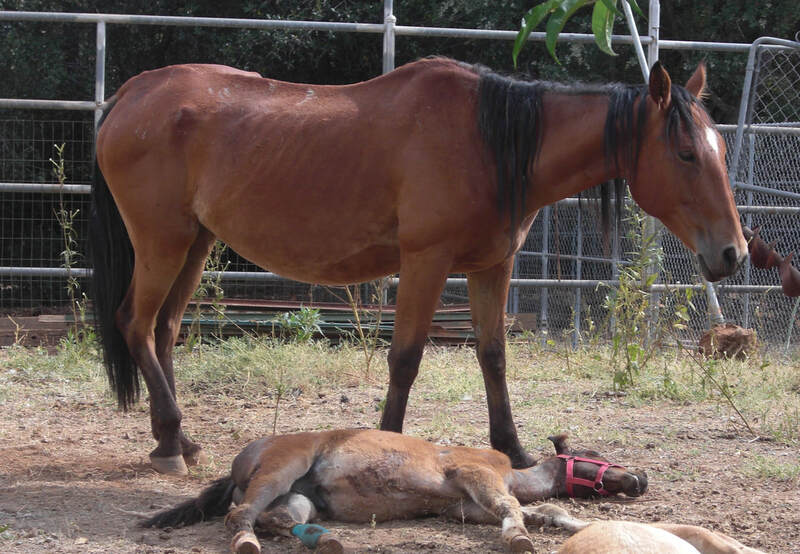 In the chaos, one newborn colt, little Clayton, was tangled in the mess and had his back leg injured. Unbeknownst to Clayton, his mom had shipped to slaughter. Somehow, Sierra and Dayton sensed his pain and kept him by their sides, shielding him from the dangers of the fearful herd. They cautiously wandered the feedlot as Clayton looked everywhere for his mom. She was nowhere to be found. Fortunately, or unfortunately, he wasn’t able to say goodbye. He didn't hear his mom nicker for him as she was forced away from him into a trailer on its way to Canada. He didn't know he'd never see her again; now he was an orphan. As days went by, Clayton's energy drained from his tiny little body, and his vision was impaired by gray clouding from an injury that became more prominent in his eye as a large ulcer began to scar. Finally, he managed to muster up the strength to sneak a suckle from Sierra. Whether it was her kind and nurturing way or her lack of strength to resist, she allowed him to nurse for merely a second. He nursed quickly, and Dayton didn't complain, even though there was not enough milk for two. Sierra’s body was fighting to produce enough milk for Dayton. There is no doubt Clayton would not have survived without Sierra. An angel on the feedlot saw the beauty in this mare, and Sierra, Dayton, and Clayton were moved aside and put into a special pen. Their ransom (a.k.a meat value) was paid by a generous donor so the feedlot would agree to release them. 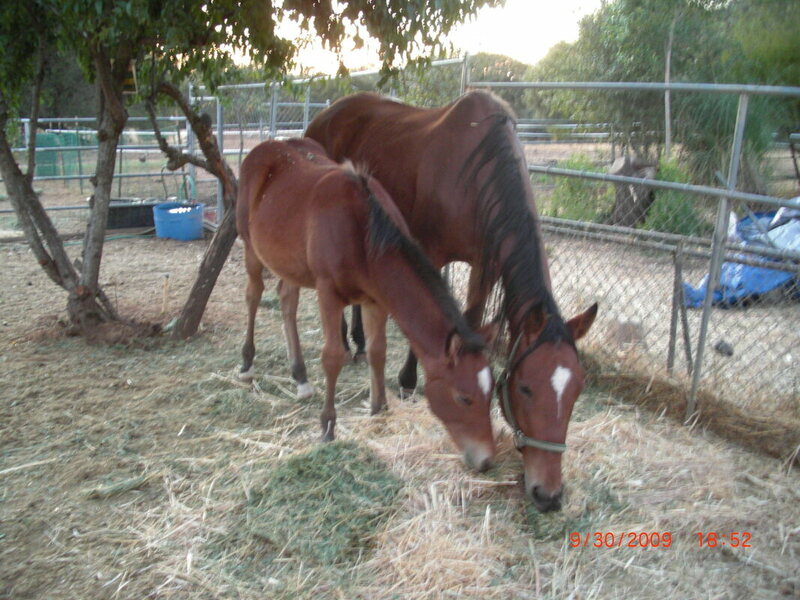 On July 9, 2009, AAE traveled to the feedlot to bring them home. As they unloaded from the long journey, it was a terribly sad sight. Sierra was skin and bones, and she moved slowly and tenderly on her feet. She had little strength, but she never let the boys out of her sight. Their long recovery had only just begun. It seemed Sierra had little or no handling or training, and she was fearful of a halter, let alone a hand, remotely close to her face. She was infested with parasites. Her mane and tail were matted with dry and lifeless hair. Because her hooves were so long and had not likely been trimmed for months and months, if ever, she was tender-footed, moving ever so slow. 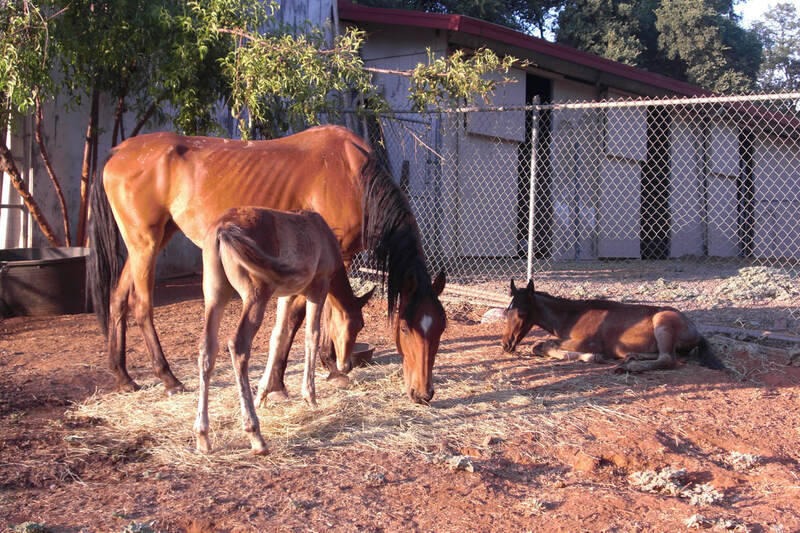 August passed, and so did her parasites; then September came, and so did a stillborn foal. Sierra's tiny lifeless colt was about four and one-half months old. 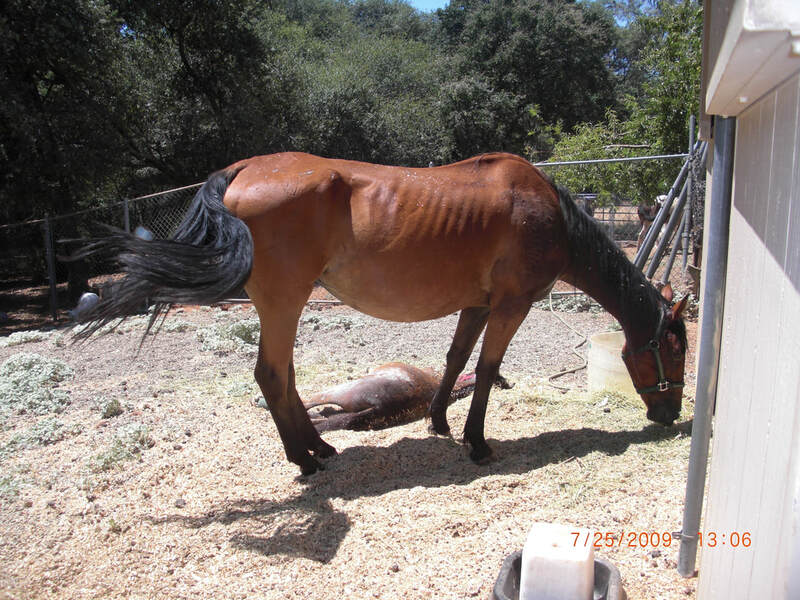 She must have been bred during her foal heat, while her emaciated body was struggling to support Dayton. The miscarriage was likely the result of severe malnutrition during the first couple months of gestation, and the toll malnutrition and pregnancy had taken on her frail body, as well as her struggles to feed her boys. Plagued not only by the loss of her foal, Sierra's tender feet had not improved. At first, it seemed it was due to her long toes, but suddenly her slow, tender pace turned to a terribly painful limp. She was barely able to walk, and looked as if she would collapse. Since she had not had much handling and would not stand for a farrier, the only option to help her was to sedate her. The vet and farrier worked in tandem to evaluate her pain. It did not take long for them to discover she had two enormous and deep abscesses, one in each front hoof. The abscesses were exposed and cleaned as best they could, and her long hooves were trimmed. It would be a long healing process as the abscessed areas grew from her hooves. Poor girl. Over the first few months, Sierra showed gradual improvement. Her hooves were slowly growing out, and her steps seem to come easier every day. She is slowly learning to trust her people friends, and she let us know she looked forward to feeding time when she knickered as we came into sight. Even though she was still very sensitive around her face, she craved the touch of a kind human hand. 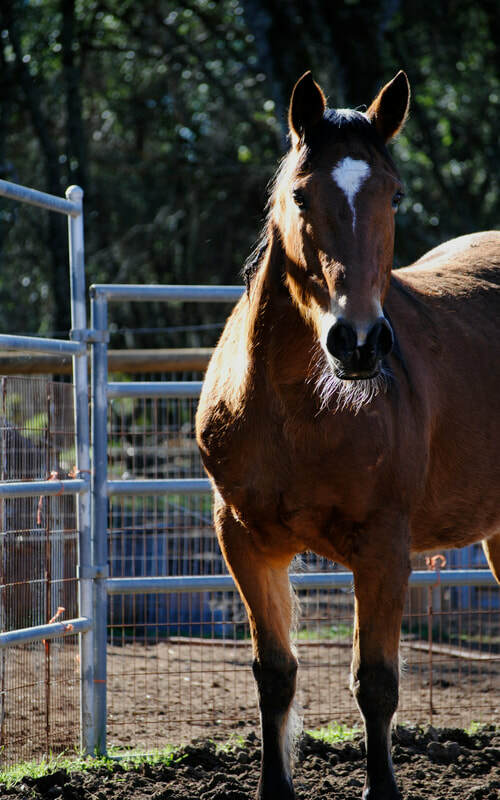 She hovered around us when we entered her paddock, and she followed us as we would walk away….as if to say, “Please don’t go”. 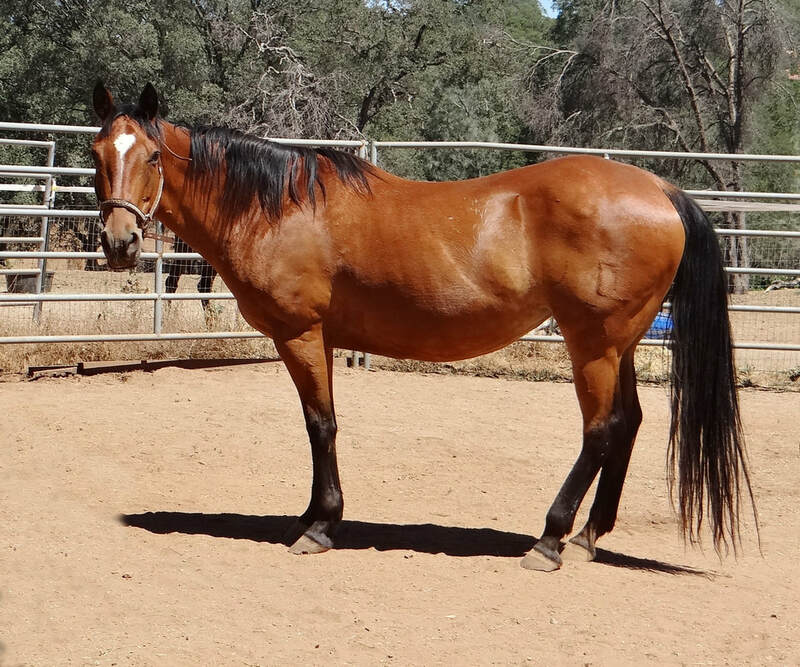 Sierra gained weight, her coat shined bright, and her nicker was full of life. Sierra was on her way to a new life! 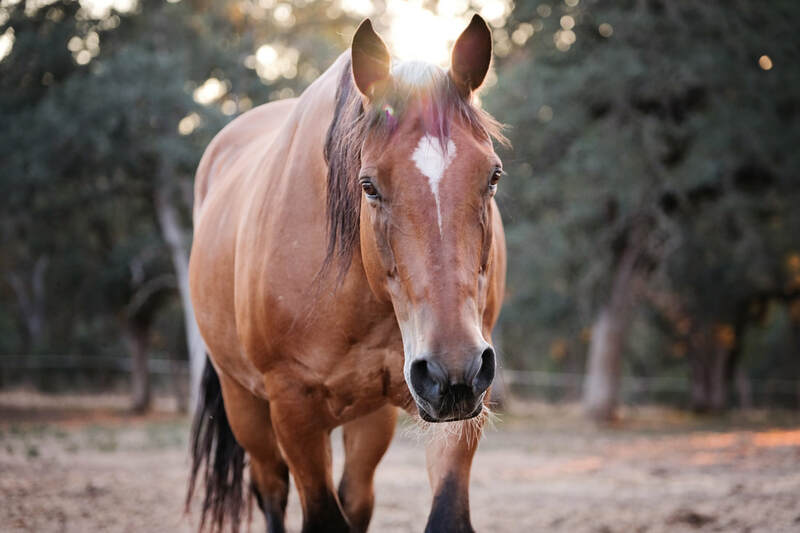 Volunteers at AAE recognized Sierra's deeply touching soul, and the healing power of this special mare, and they pleaded for her to remain a resident at AAE Sierra is the grand matriarch of the AAE herd. 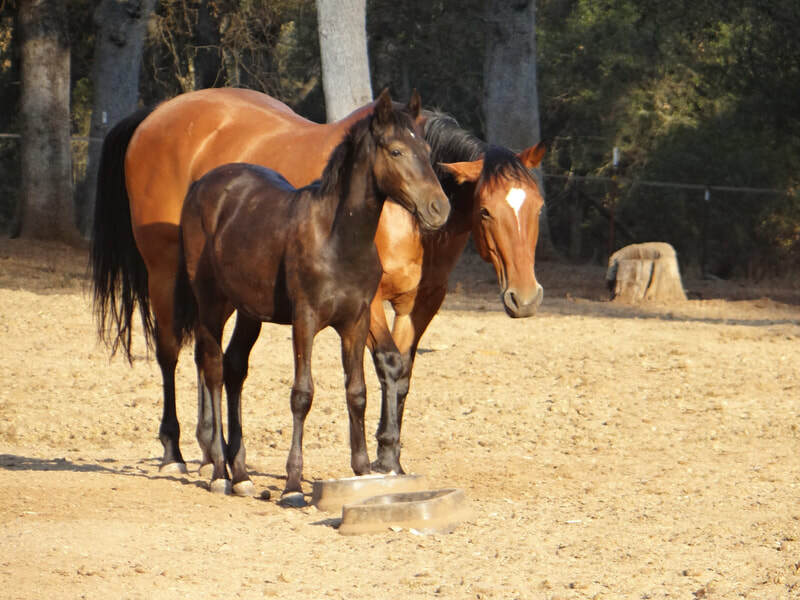 The younger horses naturally gravitate towards her for comfort and leadership, and she wisely teaches them their manners and proper horsey behavior. Her hesitation to fully trust humans remains; yet she continues to yearn for attention, hovering around humans when in her presence.